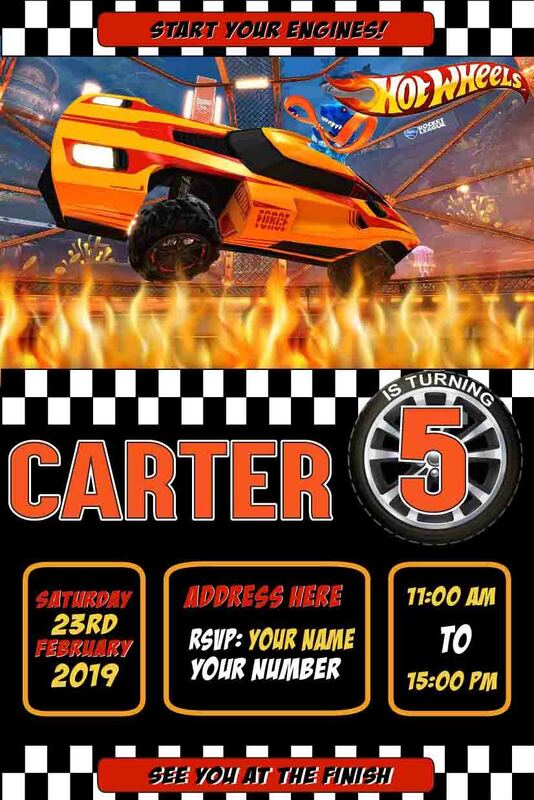 When my nephew Carter turned FIVE he wanted a… you guessed it… a Hot Wheels party. Carter is obsessed with cars, as most boys his age are! I was happy to have the theme already decided early this year, so I could get stuck into the invites. It was a very fun filled day and the kids had a blast with the jumping castle water slide and bike riding. This theme is certainly one where so much fun can be had. Boys and girls alike love playing with cars, and the thrill of the race is setting the party up to be a real winner! Get your guests excited to party with Hot Wheels by sending this unique invitation, our hot wheels invitations are hot and are ready for you to order. If your child loves hot wheels, then this design is sure to be a hit with him as well as his guests.